Is your summer heating up like ours here in North Carolina? It’s just like a sauna, often made worse by a five o’clock thunderstorm, so Steve and I retreat to our shaded deck as often as possible. 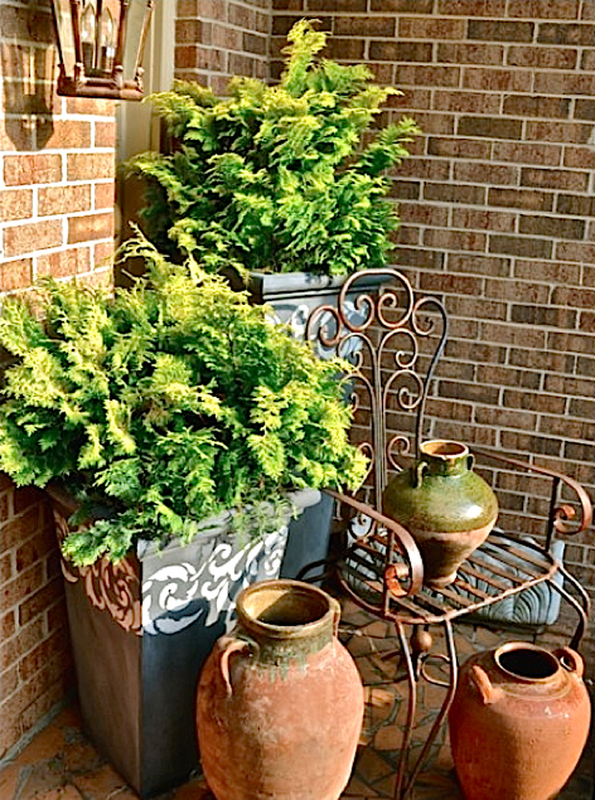 Recently I decided to add some pattern out there, but I had nothing handy to paint, so I took a metal planter from a set on our front porch to reuse. 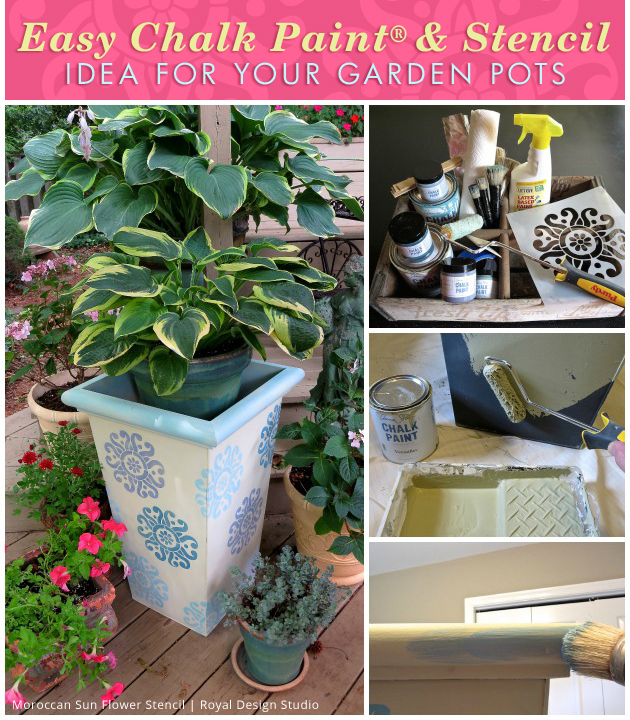 I had painted and stenciled these planters using Chalk Paint® by Annie Sloan more than two years ago. They have weathered thunderstorms, heat, ice, and snow beautifully, so repeating the process was a no-brainer. Just paint and a stencil! 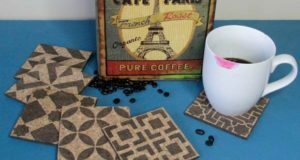 Chalk Paint® sticks like glue on metal plus it requires NO topcoat for outdoor use, so this is a quick, very simple project that you can enjoy with the kids. I remember those years of attempting to entertain our girls all summer long – quite a challenge. 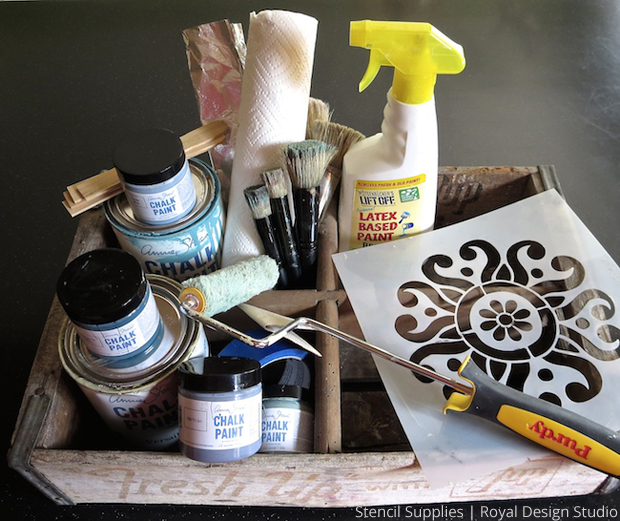 With the Versailles Chalk Paint® brush one coat over the raised areas and use a roller to paint the flat surfaces. Let dry. 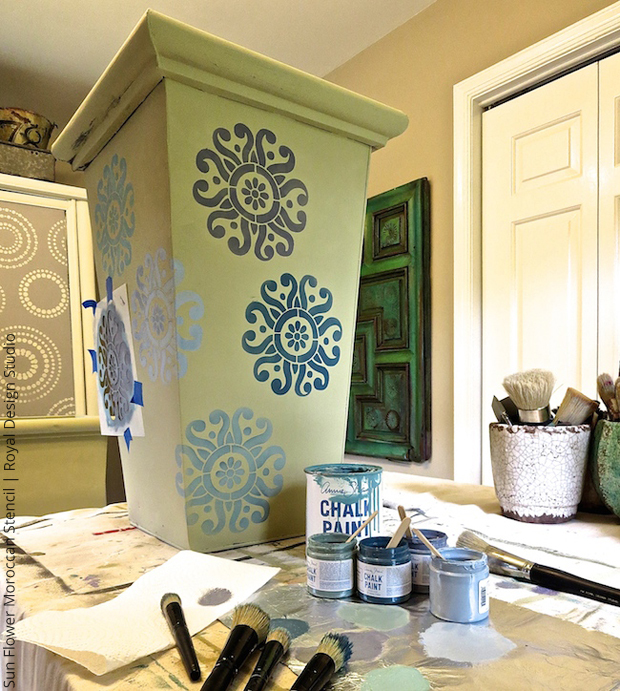 Place the stencil in random positions and use different colors. 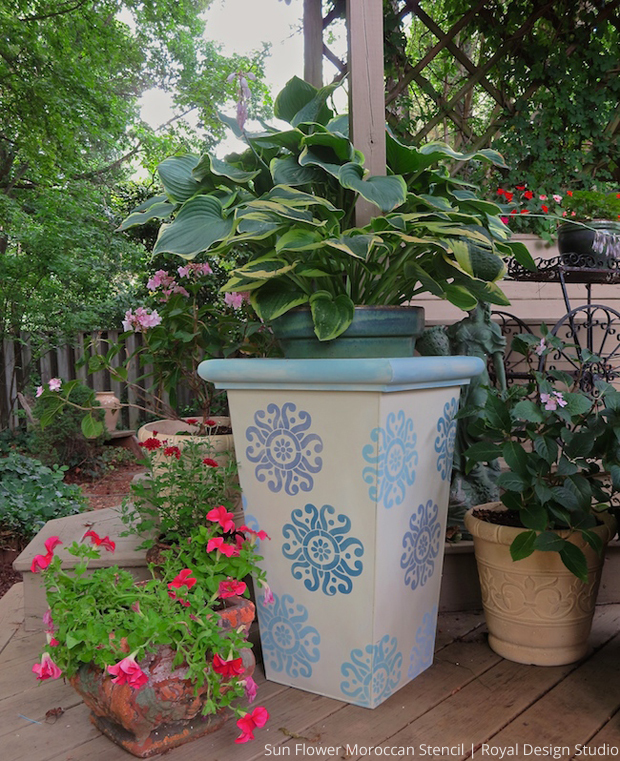 I chose this stencil for a couple of reasons: I like the scale and simplicity of the pattern relative to the size of the planter and it doesn’t require any measuring or precision. It’s especially easy to use for children. 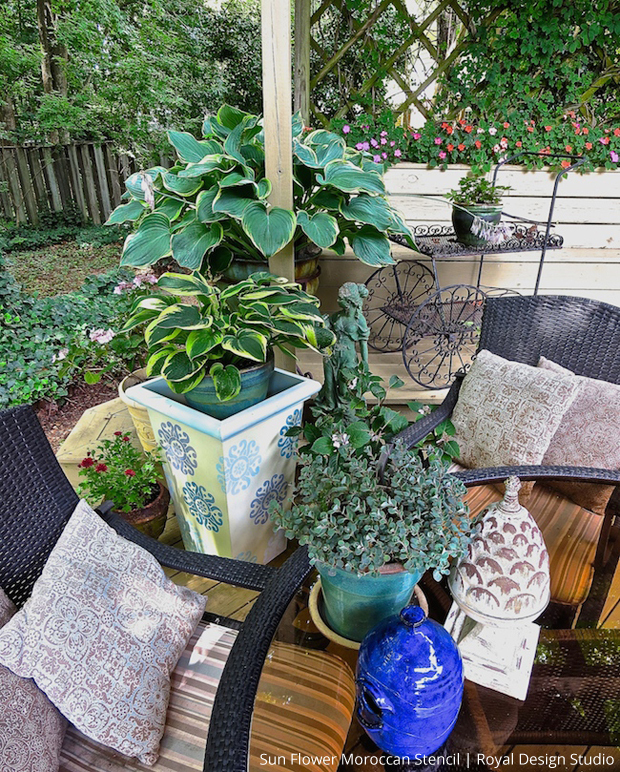 Using a dry brush, brush some Duck Egg on the top edges of the planter. Lightly sand all over and wipe off the residue. Let dry. 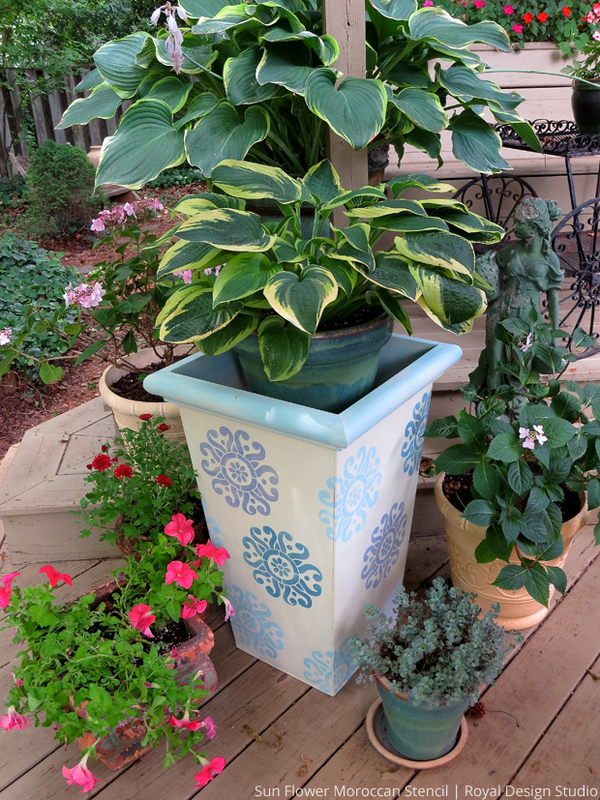 Fill with a large plant like this shade-loving Hosta, an evergreen plant or a mass of bright-blooming beauties and enjoy your beautifully patterned patio! 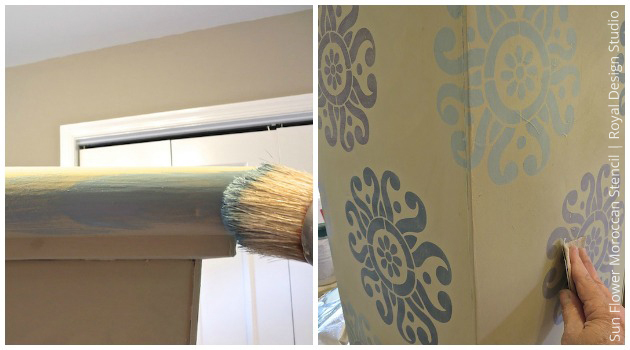 I hope you enjoyed browsing through this DIY as much as I enjoyed creating it. 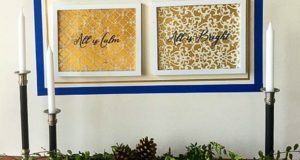 If you like working with chalk paint®, be sure to check out my post: DIY Stenciled Metal Artwork. I am sure you will love it! 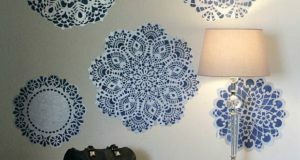 We are always eager to see your stenciled creations too! Share them with us on Royal Design Studio’s Facebook page or hashtag with #royaldesignstudio on Instagram. Is it convenient to talk at the moment? starting dosage of wellbutrin sr If the owner of a Steam account starts playing a game already being played on a separate, authorised machine, the person borrowing that game will be given a few minutes to either buy the game for themselves or quit. You really make it seem so easy along with your presentation but I find this topic to be actually something which I think I’d never understand.It sort of feels too complex and very large for me.I’m looking forward on your subsequent put up, I will attempt to getthe grasp of it! Thank you for sharing superb informations. Your site is so cool. 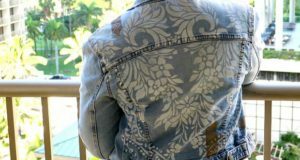 I am impressed by the details that you¡¦ve on this blog. It reveals how nicely you perceive this subject. Bookmarked this website page, will come back for more articles. You, my pal, ROCK! I found just the info I already searched all over the place and simply could not come across. What an ideal website.